From the acclaimed Aliens™ movie, we are proud to present our Officially Licensed M41A Stunt Pulse Rifles! 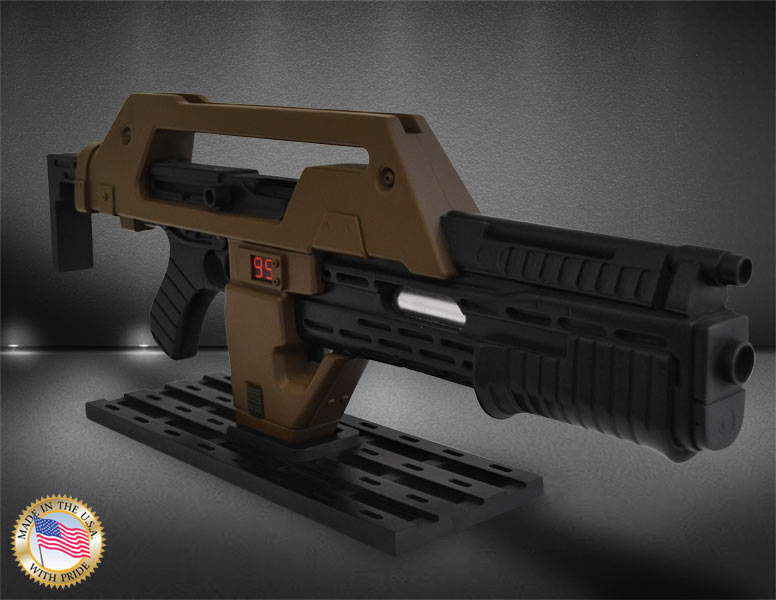 One of the most Iconic movie weapons ever to blast its way onto the big screen, the Pulse Rifle is the weapon of choice for the US Colonial Marines in James Cameron’s Oscar winning “Aliens”. To create the definitive Pulse Rifle we obtained one of the few surviving Hero Pulse Rifles, meticulously measured and photographed every detail and then painstakingly recreated this exactly. The result is the most accurate replica ever produced, a “must have” for any Aliens fan! Our Stunt version Pulse Rifle remains faithful to the ones seen in the movie, with accurate shrouds the same dimensions as the “hero” versions, but has no moving parts and weighs only 5 ½ lbs – ideal for display or Cosplay! There are four versions available: The Brown Bess, Olive Drab (OD) Green, Brown Bess Weathered and OD Green Weathered, and each comes complete with a themed tabletop display stand. The OD Green Versions are Exclusive to Hollywood Collectibles and are only available directly from our website. With a Limited Edition of just 250 individually numbered pieces of each they won’t last long! The Brown Bess versions are limited to 750 pieces of each version. Each one is made with Pride in the USA! Priced at just $499.95 each, or as little as $42 a month if you use an optional payment plan, they are available for pre-order through hollywood-collectibles.com.